Halloween is the time to enjoy and bring out the worst fears out on this howling night. But, isn’t it just scary for your pet if you ignore their safety while you are on the high vampire mood to enjoy the Halloween night. Here are some ghost rider reminders to keep your pet safe from those real Halloween dangers (not from those tricky ghosts). It is time to party and glare up into those different Halloween costumes. 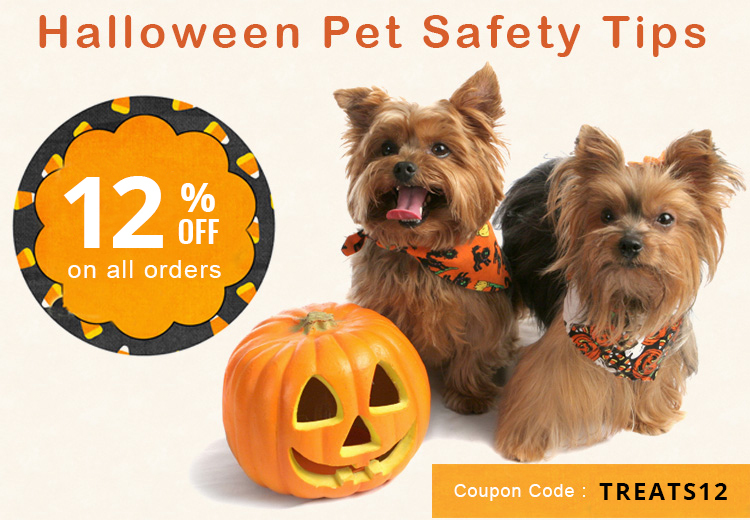 Select the one that is best suited for your pet. Choose the one that does not restrict your pet’s vision or ability to move. Also ensure that there are no small pieces anywhere around that your pet may swallow. It is better to introduce the Halloween costume one week before so she gets used to it. On the Halloween day, do not leave your pet alone outside after dusk. Especially black cat fall prey to tricksters. If your pet feels stress due to constant ringing of the doorbell, confine her to a quiet room or create a special space away from the activity. Treaters and tricksters are common on this day and your pet tries to run after them in excitement. Keep an eye on him that he just runs around the yard. Ensure that your pet is well protected with collar embellished with microchip having all the information. This is highly useful in case your pet tries to run off when you are taking him out for a Halloween trick or treat. It’s Halloween, and candy and sweets are everywhere. Chocolates and sweets are highly dangerous for your dog. So is the case with artificial sweetener used in candies and gums. To keep your pet safe from this harmful human treats, better stock your pocket with dog-friendly treats or keep them handy to distract your pet from chocolates or candies. Halloween is all about fun and tricking. But, it’s only full of enjoyment if you keep your entire family including four-legged members safe with little advance planning and a little extra care.